The Titans have waived quarterback Zach Mettenberger, according to Jim Wyatt of Titans Online (via Twitter). Mettenberger was once viewed as the team’s potential signal caller of the future, but that was before Marcus Mariota came into the picture. When the Titans used the No. 2 overall pick in the 2015 draft to tab the Oregon standout, Mettenberger’s future in Tennessee became murky. Now, he’s free to pursue a starting job elsewhere. 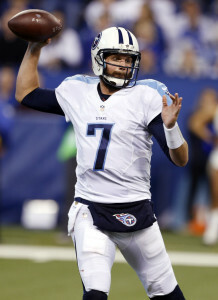 Mettenberger, 24, was a sixth-round pick of the Titans in the 2014 draft. In his rookie season, Mettenberger saw time in seven games (six starts) and threw for eight touchdowns with seven interceptions. Not long ago, Mettenberger probably would have fetched a lower-round draft pick in a trade. However, the Titans likely shopped the QB around in recent days without finding a taker. With Mettenberger out of the picture, the Titans now have quarterbacks Matt Cassel and Alex Tanney behind Mariota. In addition to Mettenberger, the Titans have waived defensive end Iosia Iosia, tight end Kevin Greene, and wide receiver Rashon Ceaser (link). The Titans have signed four rookies from their tryouts (link): fullback Sam Bergen, wide receiver Ben Roberts, defensive end Mike Smith, and cornerback Bennett Okotcha. The Titans have agreed to sign tight end Phillip Supernaw, waiving defensive tackle Lucas Vincent in a corresponding move, according to the team (via Twitter). Supernaw, who was cut by the Ravens in May, has spent time in Baltimore, Kansas City, and Houston during his NFL career. The Bills have signed former Patriots edge defender Michael Buchanan, waiving punter Spencer Roth to create a roster spot, tweets Vic Carucci of the Buffalo News. Buchanan didn’t see the field much after drafted by the Pats in the seventh round in 2013, but the 24-year-old made the most of his limited playing time in his rookie year, picking up a pair of sacks and recovering a fumble. The Colts have made a change at the back of their roster, signing undrafted free agent defensive lineman Camaron Beard and waiving cornerback Al-Hajj Shabazz, per a team release. Shabazz only lasted a few weeks with Indianapolis, having been signed by the club as a rookie free agent following the draft. The Falcons have added rookie linebacker Boris Anyama, who played his college ball at the University of Louisiana-Lafayette, the team announced today in a press release. The signing gets Atlanta’s roster back up to the maximum 90 players. The Panthers have signed defensive back Jocquel Skinner, waiving tight end Kevin Greene, tweets David Newton of ESPN.com. Skinner became a free agent after being cut by the Buccaneers in April.